Last Thursday, Gabriel and I threw a going-away party for ourselves. We had an absolute blast doing karaoke and enjoying cocktails with about 35 friends at 2nd on 2nd in the East Village. When the party ended, we found ourselves starving and rather buzzed (well, okay I was plumb drunk) and everything around was already closed. We decided to wander over to Little Italy to see if we could luck out with finding somewhere open to get big, satisfying plates of pasta. Lo and behold, we found La Mela. Open, mostly empty, pretty inexpensive and with great reviews online. We were seated right away and quickly scanned the menu. Water and bread were brought out and our orders were taken. 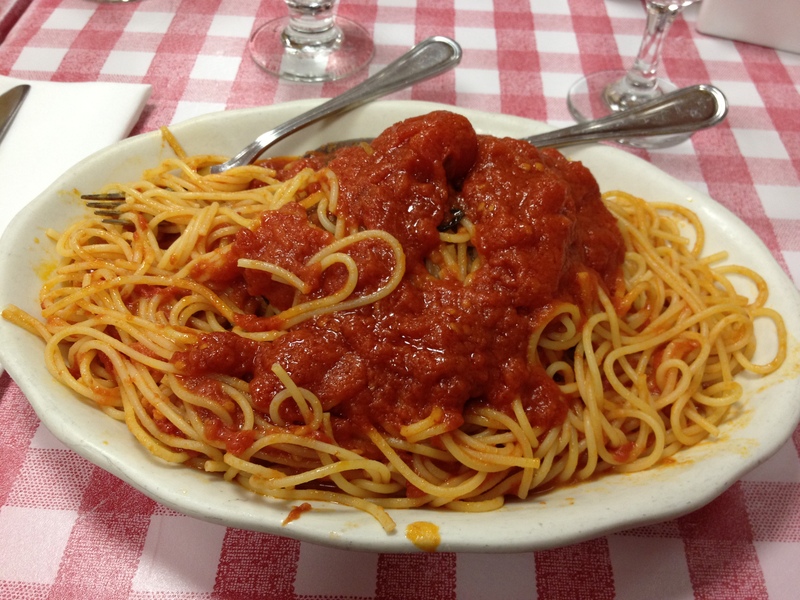 I chose the traditional spaghetti and meatballs which came out just a few moments later. Perfect. It totally hit the spot (from what I can remember) and left me with 2 extra meals worth for the following day. The meatballs were huge and delicious and the pasta sauce was bright, flavorful and hot. The pasta was definitely not homemade, but it was fine anyway, and the price was very fair. If you’re in the area, especially late at night, I’d suggest giving it a try.